It’s two out and two in at Peterborough Panthers. Here we look at the riders to be released and those drafted in to set the city club’s faltering Premier League play-off challenge back on track. Anders Thomsen is a rider tipped to reach the top in speedway. The 22 year-old is already a European Championship competitor with a taste of World Championship racing under his belt. Thomsen lined up as a wildcard in the Danish Grand Prix earlier this year as he begins to emerge at the highest levels. But he has still been tempted back to the Premier League by the offer of an end-of-season stint with Panthers for the second successive year. Thomsen also spent the final weeks of 2015 with the city club as he helped them reach the semi-finals of the play-offs with some high-scoring displays. Panthers bosses will be hoping for more of the same as he returns on what looks to be a bargain average of 6.62. Danny Halsey becomes the club’s mandatory British rider. The 27 year-old has guested for the club in the past and now has the chance to prove himself in the second tier of the sport. His form in the National League, where he has a 7.87 average for Mildenhall, could hardly have been any better of late. He produced a four-ride, 12-point maximum for the Fen Tigers just last night. Halsey will operate on a 3.00 figure in the Premier League and will line up alongside Zdenek Holub at reserve with Ashley Morris being shuffled up into the main body of the team. Tom Perry is the ultimate victim of his own success. He was a revelation at reserve in the early weeks of the season when being the only mandatory British rider to make any sort of impact in the Premier League. But he suffered a broken collarbone in a National League spill just as he was set to climb into the main body of the team and spent a month out injured. And picking up from where he left off proved to be too big a task for a rider who has been starved of points ever since. The other man to be axed, Emil Grondal, could also be classed as unfortunate given his average has marginally increased during 2016. 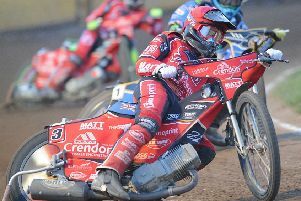 But the Danish Under 21 skipper has never really hit the heights expected of a rider who entered British speedway on a seven-point assessed average almost 14 months ago. And his most recent form has been seriously sub-standard with eight of his final 10 rides for the club ending in last places. He was quick to admit in an interview conducted over the Alwalton tannoy last night that such performances have let them team down. Grondal is a popular figure though, and as a club asset, it has to be likely that he will race for the club again in the future.